Alright guys, here we go... boldly where no Keen has gone before: Virtual Reality. Star Trek Bridge Crew is a VR title for PC and PS3 that released on May 30, 2017. You play using a VR system compatible with your platform of choice. For PC it's the Vive or Rift, and PS3 it's obviously the PSVR. Graev was kind enough to hand off his Vive to me since he now owns a PSVR. After much trial and tribulation, I finally got my Vive to work. The Aegis is trying to find a planet for the Vulcans to resettle after the loss of their planet in Star Trek (2009). You can either play through these missions or run on-going missions which are basically just one and out randomized missions. Overall gameplay itself is pretty dynamic depending on your mission and who you have on your crew. A good player at the con or in tactical makes a big difference. Perhaps even more important is how well everyone listens to the captain. Objectives come in to the captain, and the captain gets the big picture of the mission and has the task of relaying those orders to the rest of the crew. Each mission seems to have a theme: Attack, defend, assist, explore, etc. The "go here and scan this" missions can get a little old after the novelty of "wow I'm a crew on a star ship!" effect wears off. The game really shines when things get hectic. For example, when three Klingdon Birds of Pray decloak and start bombarding you. A solid crew will keep cool and play their roles. There are type types of missions: Story and On-Going Missions. The "Story" missions are the same every time and follow you through a narrative whereas the "on-going missions" are one-and-out semi-randomized encounters where you complete one of the aforementioned types of missions. I think they missed a huge opportunity to make "on-going" missions truly that: On-going. There's nothing "on-going" about them. What I like most about Bridge Crew is the roleplay. My first time playing with Graev we immediately fell naturally into the "aye Captain!" and "Helm, set a course" type lingo. We're both such diehard fans of the series (watched them all so many times we lost count) that it felt second nature. Nope! Everyone seems super into it. Some people are naturally better than others. Some people bring in the super casual "okay where are we going?" rather than "orders, Sir?" stuff. ​I'm not roleplay-elite or anything, but I do like people to stay in character. I think for a VR game it sorta relies on that. The VR tech functions pretty well. I've played a few VR games now and I think this one performs about equal to the rest. I'm using the HTC Vive which has comfortable controls that naturally become virtual 'hands'. I have the ability to make a fist or have 1 finger awkwardly pointing -- neither of which matter because once the virtual hand is near the console it automatically responds and shapes as it should to interact with the controls. There's still a degree of jankyness. Occasionally a character's arms will spaz out and flail all over the place -- happens to me often. For me this is a case of my sensors being poorly placed or my chair scooted too far out of the "playable area". You get to play this one sitting down (thank you!) so there's only a small degree of movement. 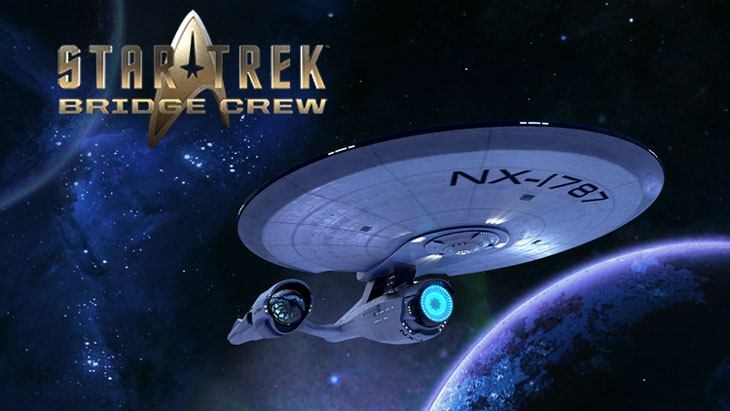 Star Trek Bridge Crew is a fun game, and a solid VR experience.​ I can happily say it's better than I expected it to be. If you already have a VR system and would even be mildly interested in Star Trek, then I say get it. I would definitely buy it again. Where I struggle is whether or not the title is worth the investment in a VR system. I think that will depend on your financial readiness to make a $500+ purchase. Would I go buy a full system just for this? Probably not. If you're on the fence to go VR for this and much more, then I think ​you can confidently take the plunge. Star Trek Bridge Crew ticks all of the boxes for me. Racing and flying Sims as well as space ship Sims like Elite Dangerous are where VR stops being a gimmick and becomes the obvious choice over monitors. If I had to guess, and I haven’t played any of them but what the hell im going to guess anyway, the Pokémon Go type semi virtual reality you can do on your phone is going to own this space for the next decade. Then maybe they will have a far less intrusive, and less goofy looking, interface for the real thing.